The cost of installation has dropped, making lifts a more frequent option, even in townhouses. PHILADELPHIA — Developers are luring downsizing baby boomers with elevators, a luxury feature that offers convenience now and the promise of easier movement as they age. Business for Newtown, Pa.-based Bell Elevator Co. Inc. is up 25 percent over the last year, said Tom Reavy, owner of the six-year-old residential-elevator firm. The aging U.S. population and the lower cost of installation – about $25,000 now compared with nearly $60,000 two decades ago – are two factors driving elevators’ growing popularity, Reavy said. In real estate, targeting the over-55 demographic once meant single-story ranchers. But today, the lifts – which are still popular in suburban mansions – are becoming more common in townhouse developments, he said. The National Association of Elevator Contractors did not have figures on the increasing presence of elevators in the home, but local industry observers agreed that the demand for them has grown. Of the 27 completed Artisan Townhouses in Philadelphia, 13 have elevators, said Scott Neifel, sales manager of Philadelphia-based Plumer & Associates Inc. Realtors. The lone unsold property does not have an elevator, and Neifel said it probably would have sold if it had one. “We are seeing them in just about any new development over a certain height,” said Matt Pincus, owner of West Chester, Pa.-based Pincus Elevator Co. 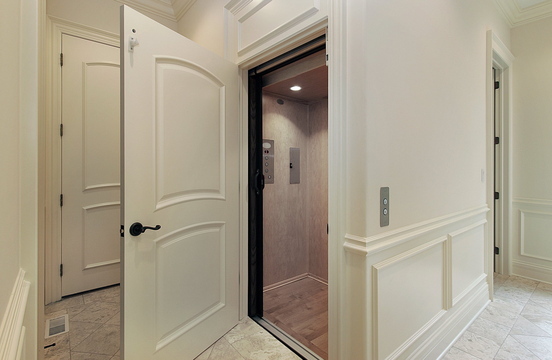 Elevators are a feature often expected in newly constructed homes of four stories or more, Pincus said. An elevator can serve as a “glorified dumbwaiter” for carting luggage or groceries between floors, Neifel said. Still, not all downsizing suburbanites are interested in them. Kathy Maris, 52, is relocating from her 3,800-square-foot Moorestown, N.J., home to Philadelphia with her husband. They considered two city townhouses with elevators, but didn’t place bids. “I look at it as just another thing that could break down,” Maris said. Reavy acknowledged that’s a possibility and suggests that buyers do their homework before purchasing. “If you buy a good product, you are going to have fewer problems,” he said, adding that service and lubrication contracts are available. Brian Stetler of Berkshire Hathaway HomeServices Fox & Roach advises his clients to consider how much they will actually use the elevator before they buy. For some homeowners, it turns into a closet, he said. Michael Cutler Builders Inc. is giving buyers an elevator option in four three-story, carriage-style townhouses under construction in Ardmore, Pa. If buyers don’t want the upgrade, the shaft provides additional closet space in the approximately 2,200-square-foot homes, said vice president Diane Cutler. One concern, Stetler said, is that the elevator will hinder resale since it takes away living space on narrow city lots.